It's hard being an alien invasion movie these days, with a flurry of them hitting the cineplexes lately it is harder and harder for films to distinguish themselves as to why we should even care to watch them. Sure, I enjoyed "District 9" and like everyone, I strongly disliked last falls "Skyline". Now, with the very promising trailers for "Battle: Los Angeles" I hoped that finally we might get a quality film that was as intelligent as it was action- packed. The presence of Aaron Eckhart certainly gives a project such as this a little more prestige than it might have otherwise garnered. 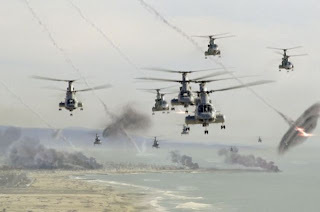 Early descriptions of the film had it basically labeled as "Skyline" with real actors, but it is much more than that, this is a full on war film where our marines could have easily been taking on some foreign enemy, but instead are facing aliens. It is also the first alien invasion film in a while that doesn't cop out at the end, this may not be as original as the storyline "District 9" offered up, but it offers an onslaught of combat that doesn't cease till its final frame. It allows the aliens to be real foes, not a group of mysterious creatures who have some mangled reason for invading earth. In fact, we never really know what the reason is the aliens are invading our planet, the glimpses we get of local news stations tells us it is for our water sources, but that is what I really enjoyed about the film. It didn't bother with the small details of it, they don't really matter when you're in the middle of it all and when you have a mission. Ramon Rodriguez takes a huge step forward from his "Transformers" break and gives a serious and solid performance as Lt. William Martinez, leading his men and a staff Sgt. with a bad reputation for losing men in battle. As staff Sgt. 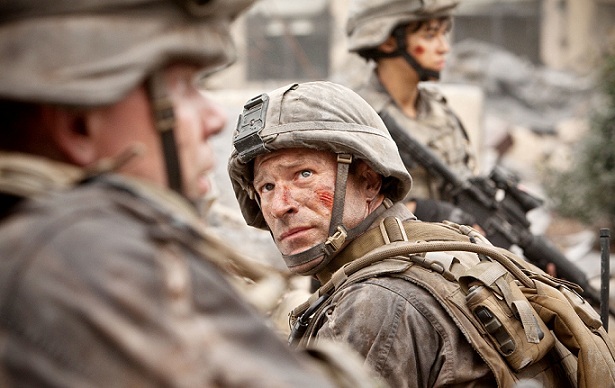 Michale Nantz, Mr. Eckhart provides a character who is to be redeemed by his actions while proving to a much younger group of marines that the stories of battle are not all so black and white. That there is real dramatic tension here between the marines helps the fact that we aren't simply following a group of soldiers we know little about. The opening moments of the film introduce us to each of them before the action really kicks in and it is a nice distraction from the video game inspired combat. That is the complaint (or compliment) I have heard most about this film. 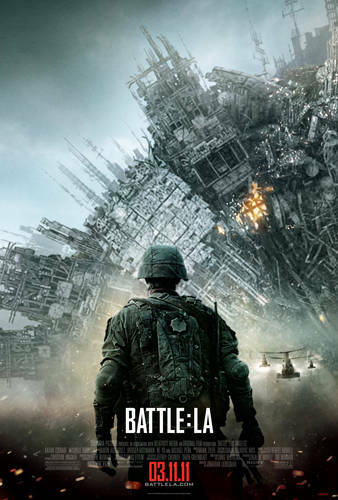 Myself, I am no gamer and have no idea or desire to play some POV shooting game, but I can see how "Battle:LA" could easily be "Halo" on the big screen.The film does begin to drag in its middle section and almost over stays its welcome at two hours, but the final battle is worth the sludge through the night scenes and there is nothing wrong with its closing moments inspiring a little American pride, even in the midst of an alien invasion. It has enough action to be labeled as a film that might suffer under that weight of countless combat scenarios, but it had enough visual flare and committed performances that I enjoyed its effort. You can see it trying to be better than the other alien films. Yes, it is a story we have seen countless times before, but don't act like you wouldn't mind a less corny "Independence Day". Director Jonathan Liebesman doesn't have the best track record, with crappy horror flicks like that "Texas Chainsaw" prequel a few years ago and "Darkness Falls" to his credit it would be easy to not expect much, but he takes some serious forward steps here and even if you aren't as pleased with the execution of this action and story, you have to admit the film looks great. Cinematographer Lukas Ettlin is to be commended though he to has no other great films to his credit other than the gritty looking "Lincoln Lawyer" opening this weekend. The scope is one of the most impressive things about this film as is its supporting cast. Along with Eckhart, it was nice to see such pro's as Bridget Moynahan, Michael Pena, and Michelle Rodriguez elevating the film to something more than just another alien invasion film.